Blog: 7 USA Teams Advance on Day 2 of Super Senior World Team Tennis Chps. 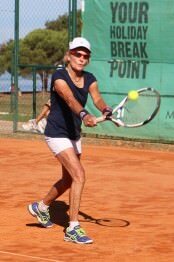 The USA advanced in seven of eight Cups at the ITF Super Senior World Team Championships in Umag, Croatia today. Kerry Young and Carol Clay, members of the USA Kitty Godfree Cup team (W65) won their matches (Young at #1 singles; Clay at doubles) 60 60 against their Ukranian opponents today, to win their round robin group. They now proceed to the medal rounds. Donna Fales teamed with Grace Woo (NY) to win her doubles match in the Queens Cup (W75) today against Switzerland. They have one more round robin match to play tomorrow to reach the final. Rose Austin successfully coached the Doris Hart Cup team to a win against New Zealand today. The team split its singles matches before winning the doubles 10-8 in a match tiebreak. The 80s is the only Cup division which uses the match tiebreak format for the third set of singles and doubles. Owen Robertson made his singles debut for the Britannia Cup (M65) today and won against Turkey in straight sets. The team won 3/0 and advanced to the medal rounds. Rudy Hernando won his singles against Sweden today at #2 singles and Joe Bachmann teamed with Bob Quall (CA) to seal a 3/0 win. They play France tomorrow; if they win they advance to the semis. Betty Wachob and won 60 75, overcoming a 52 deficit in the second set to send the tie to the doubles. The four singles players took the court for doubles, the Dutch team towering over their American opponents and overpowering them in the first set 61. The Americans were more aggressive in the second set and lobbed well to win it 62. In the third set the first four games were long; once the Dutch team won the critical fourth game they relaxed and Jelsma de Jong played very aggressively at the net, finishing the match with a smash. Rancho Santa Fe, CA and Fort Lauderdale, Florida I volunteer with the USTA and ITF. 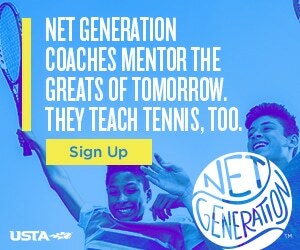 I have a tennis website, carolynnichols.com and a blog site, carolynnichols.wordpress.com. I love to play tennis all around the globe. I am an avid photographer and blogger when I'm not on the court.